I have a confession: I tell EVERYONE about Miriam Quevedo and am a Glacial White Caviar Beach Waves addict. Naturally, I jumped at the chance to interview the woman behind the brand. Miriam Quevedo’s love for cosmetics began as a young girl, working in her mother’s herbal apothecary store in Barcelona, Spain. It was there, in her first workshop, where she discovered her passion for mixing beautiful, raw materials together to unlock nature’s best kept secrets for skin and hair. Now, the brand’s mission is to combine her knowledge of the most precious and rare active ingredients with the laboratory’s state-of-the-art, scientific innovations. Choupette Social Girl: How should you transition your hair and haircare for a new season? Miriam Quevedo: First of all, get a great cut and take a bit more off than your pre-winter cut. Hair like other things in winter is a bit more dormant than in the summer, so getting more of the ends cut just as the hair enters into its faster growth cycle is always good idea. Buy a new brush with natural but firm mid-size bristles. Again, having been more dormant, using a good quality brush with bristles to stimulate the scalp will help the circulation and oxygenation as well carefully pull through any knots or remove only the hairs that need to come not break hair or remove too aggressively from the root. Regarding hair care, treat yourself to a good scalp scrub mask. You want to open your dermis and remove any excess dead skin cells that might have accumulated or been slow to turnover during the winter months. I recommend our Extreme Caviar Scalp Scrub Mask. With this product your hair will be feeling the waves — long before your feet hit the ocean. The scalp will be detoxified, fresh and super comfortable, like it is relaxing on a vacation with its potent Tahitian mother-of-pearl, coral sand and Cell-Detox peptides. These key ingredients remove dead skin, impurities, product residue that clog pores. Its cooling touch boosts micro-circulation, that can affect healthier hair. I also include a botanical phyto-active complex to help neutralize scalp imbalances. Finishing off the process is protecting power with conditioning ingredients like caviar and pro-vitamin B5 add smoothness and suppleness. Also, the scalp is “starved” from moisture for several months during winter when it’s cold and dry, so incorporate a super hydrating mask weekly if needed but definitely use a hydrating shampoo ongoing daily during your transition from winter to warmer weather. Our Glacial White Caviar Hydra-Pure Shampoo (our #1 seller) has gentle benefits of continuous hydration. Acting as pure nutrition feeds the scalp and hair from root to tip while the rich protein based Caviar restores balance and seals in moisture. Active molecular peptides help to recover elasticity, bounce and strength sealing the hair shaft and leaving it silky and soft. Additionally, a potent blend of Xilitol and Lactitol Sugars help balance the scalp’s microflora to combat dryness, flaking, and scalp irritation. Now that the weather is not as cold — finish off your shower with a very cold rinse – just a minute or so will provide a better seal to the cuticle of the hair keeping the moisture and shine. CSG: What products do you recommend for warmer temps? MQ: As the heat rises, and you are exposed to the sun and as you become more active again the sweat glands kick in and other kinds of oils and residue build up having their negative effect on the hair and scalp. I tell our clients to try the Glacial Caviar Cleansing Balm (part of the resort collection), a light but ultra lavish shampoo that will delicately remove residue, impurities protect and repair against sun, wind, salt and chlorinated water. Precious oils and botanical extracts are fused with revolutionary biotechnology to deeply penetrate with a potent cocktail of antioxidants, proteins, peptides and amino acids to help repair hair from the inside out. Also, it is important in spring because it reinforces the follicle with bio-available vitamins. Of course taking internally is a support but direct to dermis is always best. The Extreme Caviar Conditioner Balm is fortified with a Multi-Vitamin 8 Complex A B2/ B5, B8 C E H and PP). It works on so many levels to ensure optimal hair growth including boosting formation of Keratin and metabolic rate. The anti-oxidents included are key to protect the capillary structure repair damage in the root and regulate sebum production. Glacial White Caviar Beach Waves is also great product for summer. It is our texturizing formula with Mediterranean sea foam, trace minerals and camellia oil. Botanicals are mixed with encapsulated Swiss glacial water to keep the hair smooth, hydrated, strong and supple. Hyaluronic Acid, which is most often found in skin care attaches to water molecules to seals in moisture — all while creating perfectly tousled tresses for the warm weather, combating frizz. As things really heat up here is another great at home tip – try not to use a towel to dry hair after treatment and cleansing or conditioning. Use a cotton pillowcase or old sheet you cut up. Terry cloths absorbs too much moisture. Cotton [or microfiber] will prevent that and the friction that can “rough up” your hair cuticles. Combined with a finishing touch of our Glacial White Caviar Hydra-Pure rejuvenating Mist – you can all but 100% eliminate frizz. CSG: What hairstyles will be popular this season? CSG: What makes Miriam Quevedo products stand out from competitors? MQ: We are a scientifically based treatment focused hair care range. Each and every product in every category from pre-cleansing masks and scrubs to our finishing and styling are designed and clinically proven to work from the inside out. We actually treat and care for the hair and scalp with our collections using a selection of the purest actives, precious ingredients and botanicals fused with biotechnology. I considered the whole head — starting with the scalp — as the key to better hair when I was developing the Miriam Quevedo brand and each and every ingredient. The dermis is our largest organ and the transport system into and out of our body. Ensuring the health of our scalp and its functionality I was unable to unlock the key to healthy hair. A healthy scalp will ultimately support healthy hair growth from root to tip, this is always the priority forMiriam Quevedo products. Our products are clinically tested so our results have been proven not just in how you will look or feel, with scientific evaluations which we stand by 100%. CSG: What’s next for the brand? 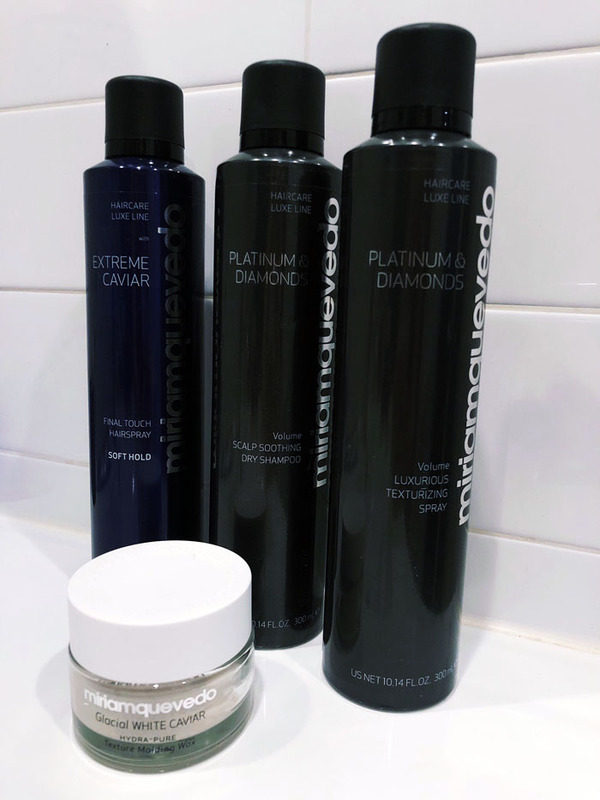 MQ: We have some exciting launches happening for Miriam Quevedo including three new Extreme Caviar shampoos and 5 treatment stylers [styling products], a new category for us. Included are two hairsprays (soft and medium hold) in our Extreme Caviar range. We will have a Scalp Soothing Dry Shampoo and a Luxurious Texturizing Spray in our Platinum & Diamonds collection, and a Texture Molding Wax with our Glacial White Caviar collection. As with all of our existing hair products, the company spent a lot of time researching the ideal ingredients for these products to not only ensure they work but that they are treating the hair at the same time. Whether it be anti-aging, treating the scalp, or repairing hair from the inside out, each new product has many benefits to deliver long-lasting results.